We’ve said it before and we’ll say it again, we LOVE pizza in this house! Some of us like it more than others but generally, when it’s pizza for tea, we’re all happy; me because it takes no preparation and less than half an hour to cook and the kids because they can use their fingers to eat! 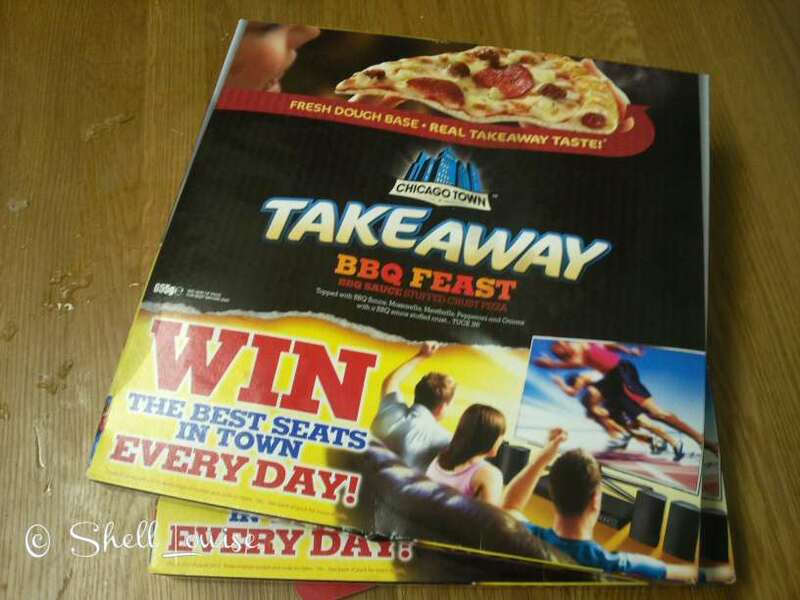 We jumped at the chance to try Chicago Town’s new BBQ Feast Takeaway Pizza. 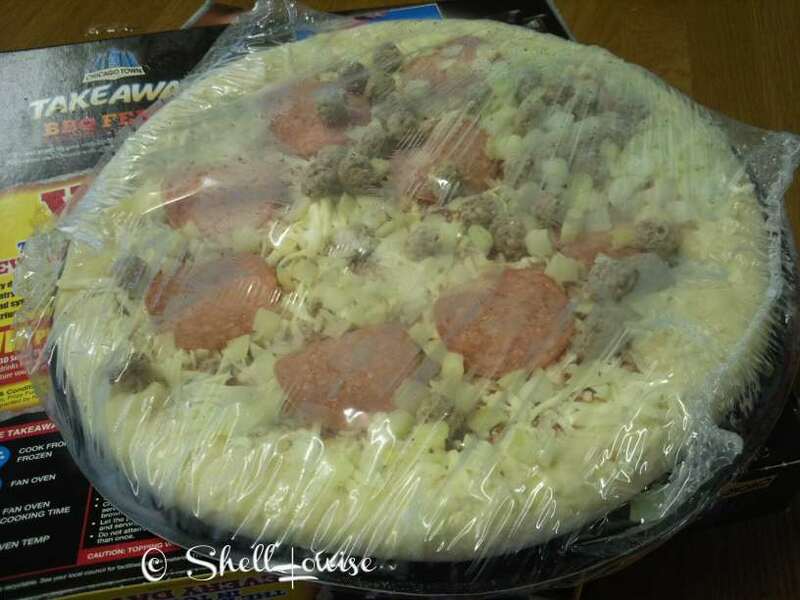 It says on the box, “Fresh dough base – real takeaway taste” and I have to agree, it did taste like it had been delivered hot to our door. It’s topped with BBQ sauce, Mozzarella, meatballs, pepperoni and onions. The crust is also stuffed with BBQ sauce. When the vouchers arrived and I found that the price of the pizza was £4 I figured we wouldn’t be buying them with our own money; we never spend more than a couple of pounds on frozen pizza usually but after seeing how big it is and how lovely it tastes, it’s definitely worth the money. It’s a big saving on a real takeaway and tastes just as good, if not better than some that we’ve had delivered in the past! The kids have been slightly obsessed with BBQ ribs lately so I assumed they’d all love a BBQ Feast Pizza. Ella (5) had to be the one to prove me wrong! She said it was too spicy for her but I think she had a small appetite that day because none of us thought it was spicy at all. She only wanted to eat the chips and even then she hardly ate any. 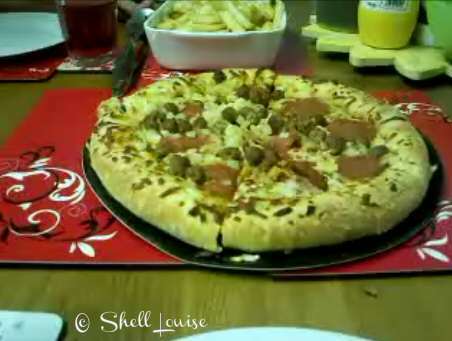 Kaycee thought it was delicious, as did my mum who’s not usually a pizza fan. I loved it and just writing about it now is making me hungry! There’s an added bonus if you buy one or more! before the end of August because they’re currently running, ‘The Best Seats In The House’, promotion. You can win a 40″ 3D Smart TV, Surround Sound System, Xbox Kinect and other great prizes. All you have to do is go to www.chicagotown.com/bestseats and enter the code that can be found inside the pack. *Disclosure of Material Connection: This is a “sponsored post.” The company who sponsored it compensated me via a cash payment, gift, or something else of value to write it. Regardless, I only recommend products or services I use personally and/or believe will be good for my readers. Acceptance of payment by any means does not guarantee a favourable review. 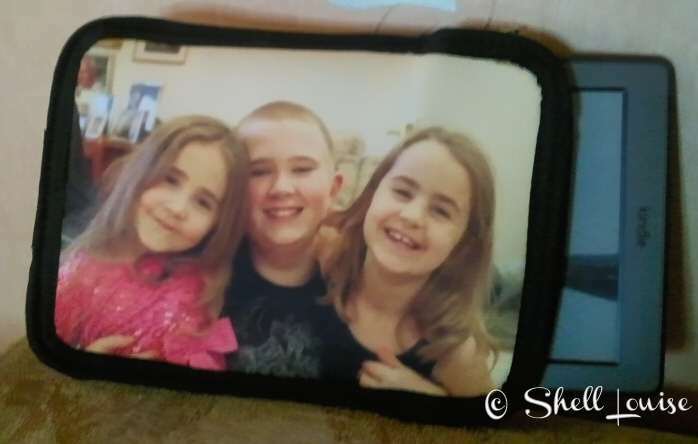 Designafriend Review – Kaycee & Ella LOVE Them! Ella’s been pushing Rose around in Kaycee’s new Hello Kitty pushchair all morning . When I asked which toy was her favourite, I should have known the answer! 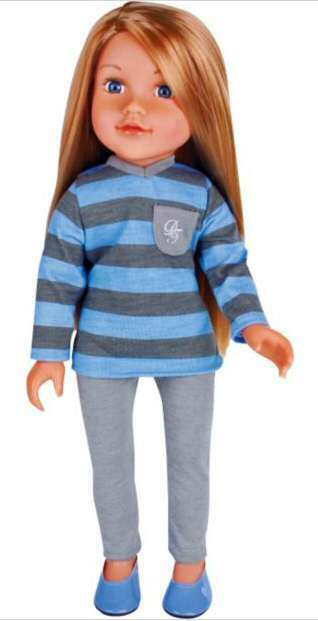 They each had a Design A Friend doll for Christmas with extra outfits and accessories; Ella received Freya and Kaycee got Chloe, who has also been renamed and is now known as Jasmine. I must admit, when the girls opened them on Christmas Day, I was extremely impressed and if I’m totally honest, a tiny bit jealous that I wasn’t 6 again! They came in pretty pink boxes and the contents were wrapped in tissue paper; to say the packaging provided a brilliant first impression would be an understatement. As soon as they were out of the box the girls oooed and ahhhed over everything from the gorgeous hair to the pretty clothes. They got most excited though when they found two charm bracelets, one for the doll and one for them; they were even more excited when they opened the extra clothes and found each one contained a charm for them to add to the bracelets. Out of everything they had for Christmas, these dolls have stood the test of time. They haven’t been abandoned to the bottom of the toy box once and surprisingly, they’ve kept all the clothes, handbags, headbands and shoes together in a box. Usually, with any toys that have extra parts, we end up searching for them after a couple of months and while the odd shoe has gone astray, for the most part they’ve taken really good care of everything. I’ve been trying to think of some negative points. When I read reviews, I want to know the bad as well as the good. To be totally honest, I can’t think of any. I do however, love the fact that these fashion dolls, unlike others, don’t have skimpy clothes and they’re not wearing make-up. We want our girls to stay innocent children for as long as possible. We don’t believe make-up and adult style clothes made small for little girls is the right way to do this. We’ll be adding to their clothes collections this Christmas because we know it will definitely be money well spent. I saw that Honest Mum had launched a new competition when I was checking my Facebook news feed this morning. It caught my attention because it mentioned photos; I’ve had a growing interest in photography since starting my blog so I had to go check out the post. Looking at it now though, I think I may have sharpened the photo a little too much but as I said, I’m still learning so I forgive myself! I’ve been finding tutorials to see what other things it can do and I’m now going to go and learn how to take an object from one picture and put it on a different picture! You can choose between a full size Jamaica Ginger cake (hubby’s favourite! ), a packet of Jaffa Cake bars (my favourite!) or a packet of Chocolate Hobnob Flapjacks (the kid’s favourite for lunch boxes!). After you’ve liked the Facebook page, click the link on the wall, go to the app and print out your voucher. Why not grab yours in time for the Jubilee weekend and enjoy it with a nice cuppa! shapes how they live the rest of their lives. which occurred in our own lives. internalised through their life experience. underlying anxieties, which blight children’s lives. with the ease and curiosity, which should be every child’s right. them to continue their growth and development toward confident adulthood. winning medals for the games and really get their competitive juices flowing. Below is a great tutorial provided by cutfoam who offer foam cut to any size. 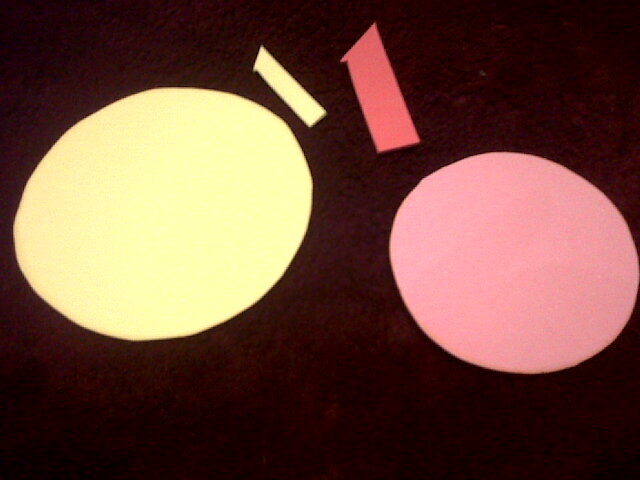 Yellow, plus one other colour, sheets of foam. slightly smaller than the other and this time the yellow one smallest. 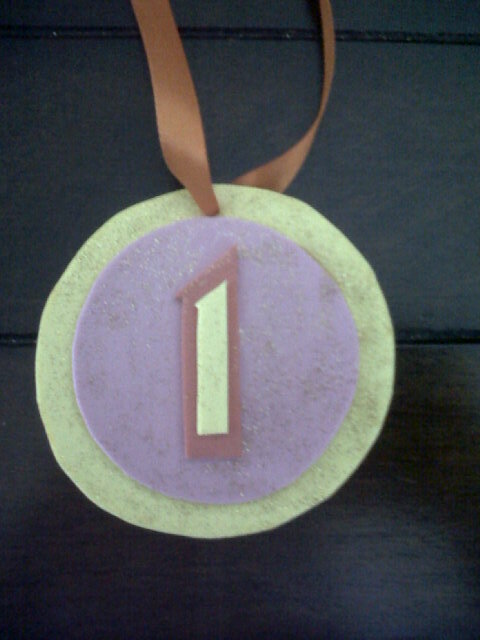 pull a ribbon through the hole to tie around the neck of the winner! Mumsnet bloggers network sent me Emeli Sande’s, Our Version of Events CD to review. It’s now the CD I listen to on a daily basis while I’m cleaning up after the kids after left for school! 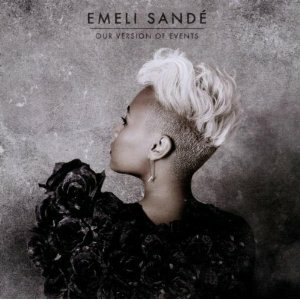 I have to admit that I’d never heard of Emeli Sande before I got the CD. When I buy a CD from a new artist, I can usually tell after listening to it about 3 or 4 times, whether it’s going to become one of my favourites or one that gets abandoned on the shelf. This is now one of my favourites. She has such a beautiful voice and once you pick up the lyrics, you can’t help singing along. I turn the volume up (when hubby’s not home, of course. He’s not into loud music!) so I can sing without the worry someone might hear me! I’m not the only Emeli Sande fan in the house; I shouldn’t have been surprised to hear that my 12 year old son knows who she is and likes her songs and even KayCee sings along! have editorial control and retain full editorial integrity”. We were sent a voucher for a Dr Oetker Ristorante pizza a couple of weeks ago and we only just got round to actually fetching it from the shops! 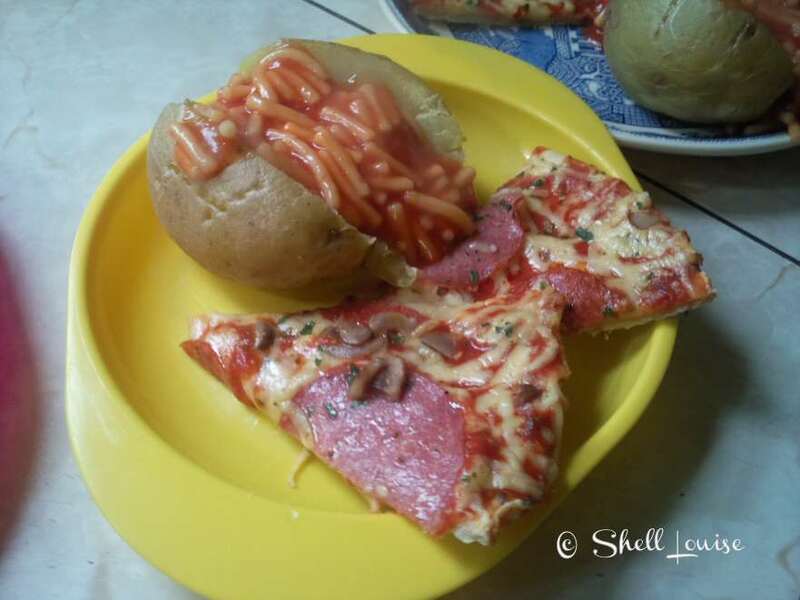 The kids asked for baked potato and spaghetti in tomato sauce with their pizza. With the exception of Ella (she’s not keen on pepperoni; it’s a bit spicy for her so she gave hers to KayCee) we all really enjoyed our dinner and I especially enjoyed the short time it took to get dinner on the table! On those evenings when things are a bit hectic and time is running away with you, it’s great to be able to get dinner on the table in under 15 minutes. I can’t say whether these pizzas are the best pizzaria taste this side of Naples because I’ve never been to Naples but they are delicious! The second thing to impress me was the actual product! 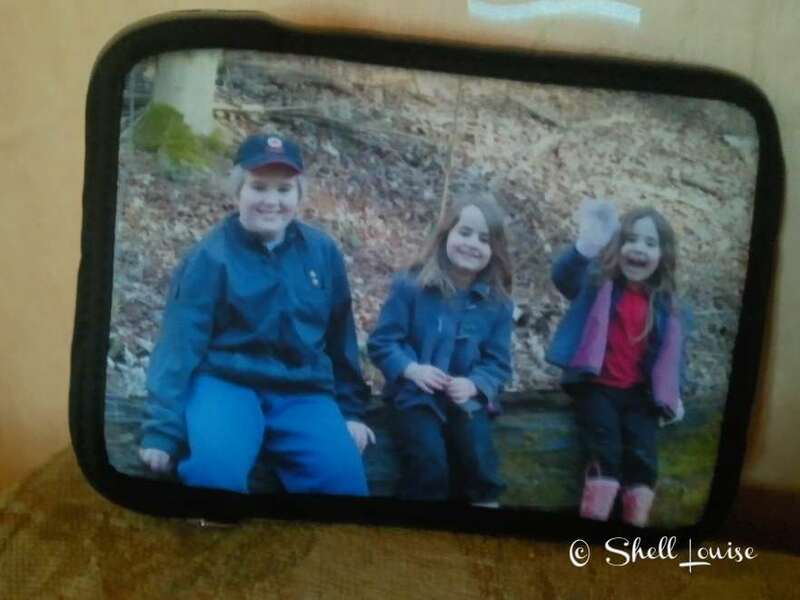 To say I’m pleased with the kindle case would be a huge understatement. I LOVE it! It’s soft to the touch, the quality of the printed photos on the material is excellent and it’s really well made. My photos don’t do it justice at all! I spent ages on the site, trying to decide what to order! They have birthday gifts, valentines gifts, new baby gifts, anniversary gifts for men, Christmas gifts and a whole host of other gift ideas. I’ve seen loads of things that I know family members would love to receive at Christmas or as birthday gifts and loads more things that I’d love to treat myself to! 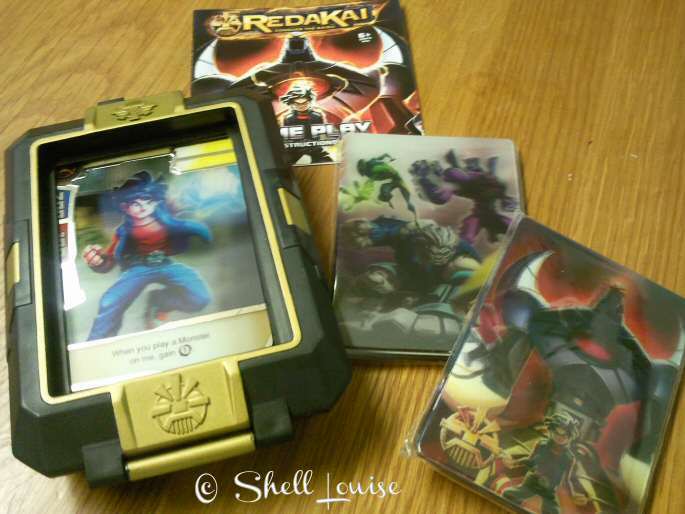 I’d never heard of Redakai but of course, my 12 year old son had and he was really pleased when I showed him the pack we’d been sent to review! I’ve always been sceptical about these kind of card games. Aiden started collecting Pokemon cards a few years ago and I just saw them as a waste of money. I couldn’t understand how the battles you see on the TV or on the Gameboy, (yes, I’m showing my age now! I was hooked on Pokemon on the Gameboy when Aiden was a toddler!) could translate to a card game. To be honest though, I never took the time to find out how you actually played it. Maybe if I had, I could have spent more quality time with Aiden doing something he loved; I was pleasantly surprised to find that I actually enjoyed playing Redakai! I did take me a while to actually understand the rules and aim of the game but with help from Aiden, I eventually got the hang of it. Now I know how to play, I can’t understand why I got so confused in the first place; it’s really quite easy! I think I probably expected it to be more complicated so I was over thinking it when I read the game play instructions. 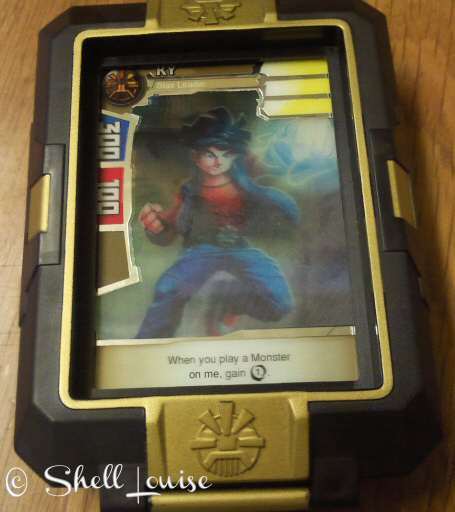 In the box you get an assortment of Character cards, monster cards and attack cards. You each pick a Character card then use monster cards to help your own character and attack cards to attack your opponent. Monster cards can heal damage you’ve been dealt from an attack and they can also increase your defence zones. You do need a box each really to be able to play a proper game but seeing as we only had one box sent for review, we split the deck in half and played a mini game for the purpose of the review! Aiden won the first time we played but I’m ready for a rematch! A lot of games aimed at children can become a bit of a chore because of the mind numbing boredom but this game kept me interested and was enough of a challenge to stop me getting bored too quickly. 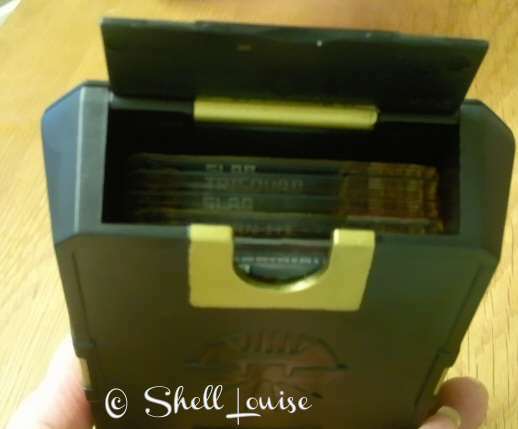 The cards are stored in the plastic box and they’re very strong, which is a plus point in this house because Ella (4) won’t be able to do as much damage as she would if they were just made of card! We both love the 3d effect and the movement on the attack cards is great. Redakai comes to life with amazing Blast3D™ Technology! Redakai has innovative “Stack to Battle” gameplay. Stack attacks to damage your opponent, and stack monsters to power up your own defenses. Redakai is highly visual and intuitive, easy for kids (and parents) to learn, but a lifetime to master. 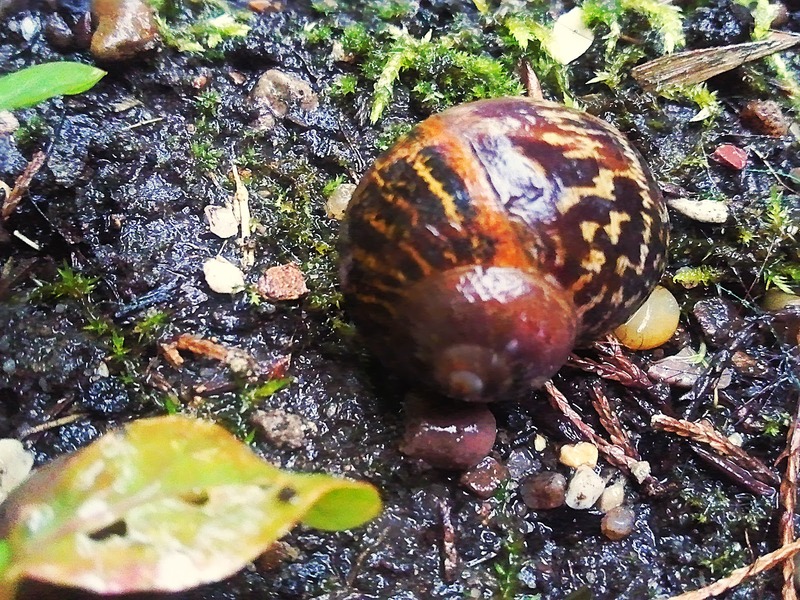 There are two versions – Basic and Advanced game play. 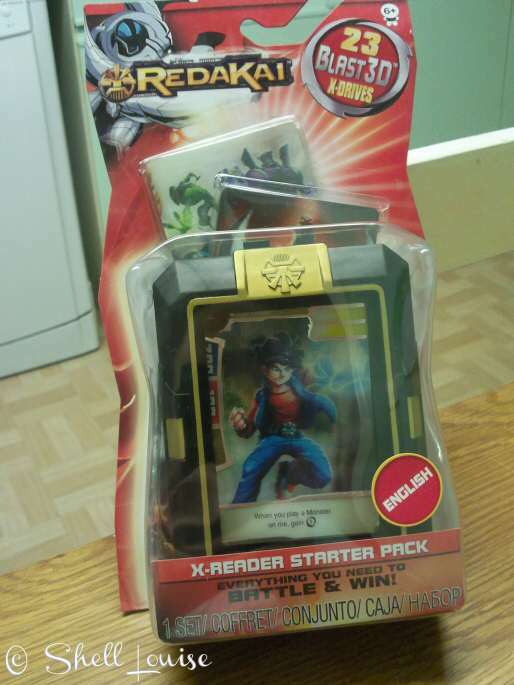 The Starter Set enables you to play the basic gameplay.